Tanya Maren Ruetzler, PhD, teaches a variety of hospitality management courses with the primary focus in foodservice operations. She is also a Certified Hospitality Educator (CHE). 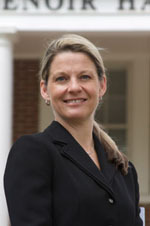 Dr. Ruetzler completed her doctoral studies at the University of Southern Mississippi in Hattiesburg, Mississippi. Building upon a nutrition and hospitality management background, her past research focused on cross-cultural perceptions of foodservice operations. Currently, she is working on two other areas of research including undergraduate hospitality management competencies desired by industry recruiters and factors that influence purchasing behaviors of beer and wine.